Smart WiFi touch control stepless dimmer switch This 1 Gang touch dimmer switch supports maximum power of 400W that can work with most lights with dimming function. This dimmer provides the maximum amount of stepless dimming range, user can dim the light to save more electricity and extend bulb life. Premium quality Made of flame-resistant ABS shell and toughened glass panel that ensures a good durability. 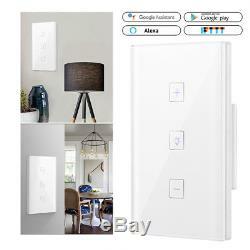 Luxury and fashion design that..
Smart Light Dimmer Wall Touch Control WiFi Light Switch Work with Alexa Google. Smart WiFi touch control stepless dimmer switch. This 1 Gang touch dimmer switch supports maximum power of 400W that can work with most lights with dimming function. Made of flame-resistant ABS shell and toughened glass panel that ensures a good durability. Luxury and fashion design that can be well fit into most places with different decorate style. Compatible with Amazon Alexa / Google Home / IFTTT. User can control this stepless WiFi dimmer via voice through Alexa / Google device to turn on/off the light and adjust the brightness. Connect APP with IFTTT, then you can create triggers and actions on IFTTT website/APP and control your lights. These make the operation more convenient and more intelligent. Support timer on/off function and it can set many groups of timer settings. Support network off work function, the timer setting can work as usual even if the network is shutting down. When installing, this Wi-Fi touch switch need to connect to a Neutral line. This dimmer only supports to adjust the light brightness, it can not change the light color. The light connect with this dimmer must support diming function. Type: 1 Gang Touch Wi-Fi Dimmer Material: Flame-resistant ABS, toughened glass Quantity: 1 pc/4/10pcs Item Color: White. Rated Voltage: AC 100V-240V, 50/60Hz Max. Load: 400W / gang (Resistive load) Max. 2.4GHz, IEEE 802.11 b/g/n. LED, Incandescent lamp, halogen lamp. 127.63.2cm / 4.731.3 (LWH). 0.165kg / 5.8oz. [Datacaciques code start, don't modify it]. Please list your special requests color, packages, etc. Please note the item has to be in original condition as received and unopened. For security and health and safety reasons we will not accept the return products that have been used. We are lemontree, a professional worldwide wholesale company, with our own factory located in China. Please come back soon and visit us again! High Quality, Best Price & Excellent Service. Flexible 24/48 LED Aquarium Light Arm Clip on Plant Grow Fish Tank Lighting Lamp. Clear Acrylic Makeup Case Storage Cosmetic Organizer Drawer Insert Holder Box. Universal Table/Desk Holder Tablet Stand Mount For iPad Mini/ Air 1 2 3 4 Retina. Electric Pet Dog Collar Shock Vibration Sound IP68 Waterproof Remote Training. Bluetooth Receiver Wireless Music Adapter Car Kits For Audio Streaming System GE. 2-10Pcs CAPSULES FOR DOLCE GUSTO RECHARGEABLE REFILLABLE REUSABLE COFFEE EMOHOME. USB/AUX Switch FOR VW NAV231/268MF RCD510+ RCD310+ RCD300+ RNS315 POLO VW Touran. NEW Refillable Reusable Coffee Capsule Pods Cup for Nescafe Dolce Gusto Machine. The item "Smart Light Dimmer Wall Touch Control WiFi Light Switch Work with Alexa Google" is in sale since Wednesday, March 21, 2018. This item is in the category "Home & Garden\Home Improvement\Electrical & Solar\Switches & Outlets\Dimmers". The seller is "go-excellent" and is located in Hong Kong.